Nero Wolfe, also known as the galloping gourmet, was an armchair detective. He rarely left the house; instead his assistant, Archie Goodwin, would collect the facts and report back. Nero Wolfe would probably not have taken on many cases had he not needed the clients’ money to pay for his two true passions: fine food and the collecting of orchids. The New Adventures of Nero Wolfe is based on a series of books begun in 1934 by Rex Stout. 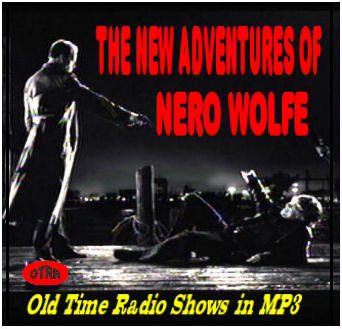 There were two previous incarnations of the radio series: The Adventures of Nero Wolfe which ran in 1943 and 1944 and The New Adventures of (aka The Amazing) Nero Wolfe which ran in 1945 to 1946. Very few episodes from these earlier series are in circulation today. There was also one later series created by the Canadian Broadcasting Company in 1982. 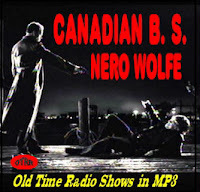 Many thanks to the Old Time Radio Researchers Group for preserving this great series for future generations to enjoy! Episodes from this series are included as they were produced by the Canadian Broadcasting Company and are still under copyright. There are 13 episodes in this series; which ran from 16 January 1982 until 10 April 1982. All 13 shows are currently in circulation. have in my collection now. The links (under Miscellaneous Undocumented) to Not Quite Dead Enough, pt 1 and The Doorbell Rang, pt 2 appear to be broken. Are you able to provide these? I've enjoyed listening to some of the CBC episodes-many thanks. Very clear sound! I love this series. Thank you for sharing!